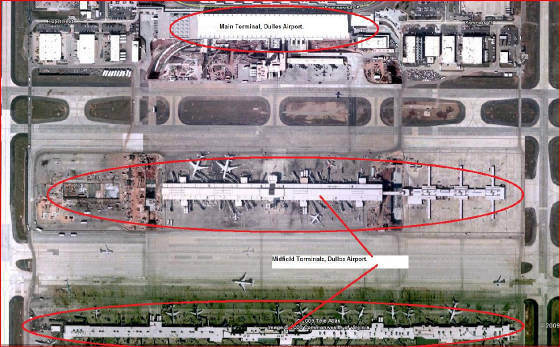 4 June 2013 -- Anonymous communications over the Internet have recently persuaded me to reevaluate the facts and conclusions contained in this article, “Dulles Airport” Shadow casts Doubt on US Government’s 9/11 Conspiracy Theory, with the result that I now repudiate and retract it. However, by admitting my errors, I do not intend to say that the 9/11 Dulles Airport surveillance video is authentic beyond any reasonable doubt; indeed, this video remains very highly suspect, but not for the reasons given in this article. The shadows of passersby seen in the far background of the film are apparently cast by daylight through the terminal windows, and not, as I have erroneously maintained, by direct sunlight. These passersby are walking under the terminal roof in front of the entrance to the security screening area and not, as I have incorrectly stated, outside the terminal entrance. Some nearby vertical support columns built along the north face of the terminal also cast shadows from the daylight. These columns, as well as the passersby, are also reflected off the polished floor of the terminal. From the very beginning I missed these tell-tale features, and I now thank those who have pointed them out to me, whoever they may be. I also apologize to those whom I have misled for so long. It was certainly not my intention to do so, and I take full responsibility. Having said this humbly and sincerely, let me add a valuable lesson that has been learned. There is an impassible gulf between the government and the people which does not allow a mutually free flow of information and ideas. This entire matter could have been and should have been nipped in the bud long ago, but there was no good faith interaction with any duly established government entity, especially the US Department of Justice and the Federal Bureau of Investigation. This is especially galling to me because it was the lack of any 9/11 Newark Airport surveillance video evidence of any of the alleged hijackers or passengers on United Airlines Flight 93, including my boss, who was a Federal employee travelling to San Francisco on official government business, that spurred me to probe in this area and initiate contact in 2009 with the DOJ and FBI by email, telephone and personal visit. To this day the walls of silence and of shunning still stand. The sheer lack of routine 9/11 surveillance video evidence from Logan and Newark airports, and the lack of credible 9/11 surveillance video evidence from Dulles airport, remain perhaps the weakest link in the US Government’s absurd 19 hijacker conspiracy theory. Nearly twelve years after 9/11, the complete lack of accountability on this particular issue, and many other 9/11 issues besides, is absolute proof of a cover-up. The 9/11 Dulles Airport video lacks a time stamp. For this reason, had Osama bin Laden lived to stand trial and face his accusers, use of this video as evidence by the prosecution would very likely have been denied by the judge. On the other hand, the defense might have found in this video, in combination with several other circumstances, a basis on which to argue that their defendant was framed. Hopefully there will finally be a 9/11 judicial discovery process in the forthcoming trial of Sulaiman Abu Ghaith, set for January 2014 in the southern district of New York in New York City, where the truth about 9/11 will finally emerge more than twelve years after the event. Code Fuchsia! Code Fuchsia! Code Fuchsia! Despite pressure to downgrade to a red alert, the fuchsia alert remains operative. How can the shadows of passersby outside the main terminal at "Dulles Airport" be explained? What are the implications of the unimpeachable witness of the sun and its shadow? Basic geometry and astronomy show that former US Attorney General John Ashcroft & Company framed the Arabs for the "Shock & Awe" crimes of 9/11 and the Obama Administration is at the very least an accessory after the fact to the crime of the century. Will the Supreme Court of the United States expose this fraud before the upcoming show trial of Khalid Sheikh Mohammed and before the Zionists expand the wars into Iran and beyond on yet another deception? Will Chief Judge Traxler of the US Court of Appeals for the 4th Circuit in Richmond order a new trial for Zacharias Moussaoui based on the following new information? Or, will Moussaoui's court-appointed lawyer act in the best interests of his client? Don't hold your breath waiting for an answer! It has been well over a year since my discovery of this bogus 9/11 "Dulles Airport" video surveillance tape, yet I must continue to try to pierce the conspiracy of silence and of shunning built around this matter. It is not by accident that there is still no "proper judicial discovery process" whereby a citizen confronts his government with damning evidence against it. After all, heads should roll once we get beyond the state of denial and the concomitant denial of due process. The bogus video tape means foreknowledge; foreknowledge means treason at home and war crimes abroad. Here's a still (below) from a TV news broadcast of 21 July 2004, the night before the publisher's release of the 9/11 Commission Report. You see the Main Terminal at Washington Dulles International Airport. The TV broadcast went on to show a video of five alleged hijackers passing through a security checkpoint on the morning of 11 September 2001. The South Carolina law firm Motley Rice LLC allegedly provided the 9/11 "Dulles Airport" surveillance video to the Associated Press, which in turn provided it to TV stations. But as you are about to learn, there are significant problems with this surveillance video. Recent feedback from the Metropolitan Washington Airports Authority makes me certain that the video is a total fraud. 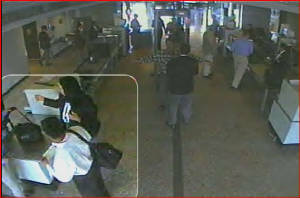 In the photo at right, taken from a video that the US Government offered as an exhibit at the Zacharias Moussaoui trial, you see at the lower left a 9/11 suspect allegedly at a Dulles Airport security checkpoint on the morning of 9/11. (A film editor framed this suspect in a box for demonstration purposes.) But I draw your attention to the pedestrian in the far background just outside the terminal entrance at the extreme top left of the entrance. 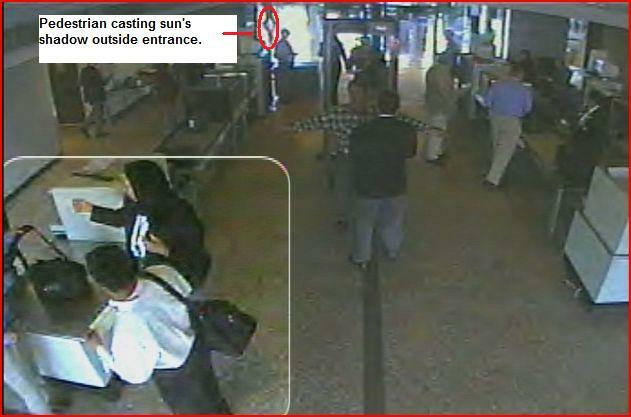 Note his or her shadow being cast by the sun and how it points directly toward the closed circuit television camera (CCTV) filming the alleged hijacker inside the terminal. 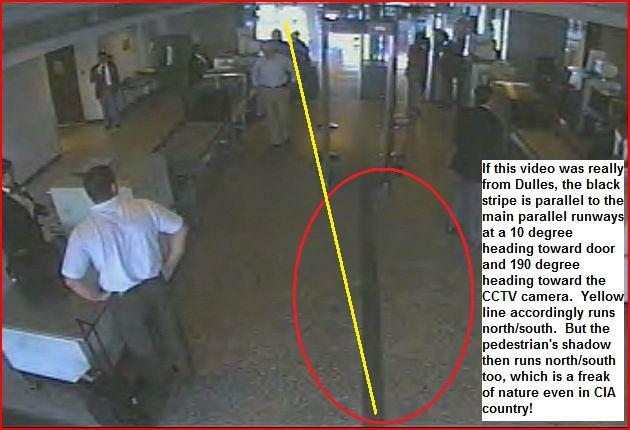 Note also the angle of the pedestrian's shadow in relation to the thick black stripe that runs along the terminal floor from right below the CCTV and straight to the metal detector. Keep all this in mind as you scroll down. At right is a close-up of the pedestrian outside the terminal. 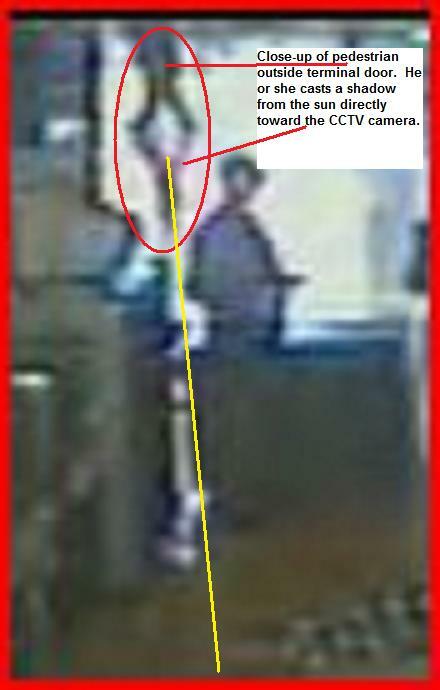 Again, note that his or her shadow points right at the CCTV camera filming the alleged hijacker. For those in the "9/11 Truth Movement" who profess they cannot see the pedestrian's shadow in this film, a series of edited photos appears in Appendix B at the end of this presentation. Also, a link to the video on the US Courts website appears right below, and by viewing it the reader will see that many other passersby were also casting shadows from the sun in this timeframe right outside the main terminal entrance. and then scroll down to Exhibit NT00211 and click for download. Now, we turn to Google Earth for a lesson in geography which will enable us to put the pedestrian's shadow in the right perspective. At left is a satellite photo of Washington Dulles International Airport from 36,000 feet. The two main runways are parallel and go north/south, or, at headings of 10° and 190°. (These headings are painted in white at the ends of the runways in aviation shorthand 1L and 1R (one left and one right) for jets approaching from the south on a 10° heading and 19L and 19R (nineteen left and nineteen right) for jets approaching from the north on a 190° heading.) Note the airline terminals situated between the two parallel runways right below the highway traffic oval highlighted in yellow. In a closer Google Earth image at left, from 13,000 feet, you have a better view of the airport terminals in between the parallel main runways. The north and south faces of these terminals are perpendicular to the main parallel runways and therefore they run at headings of 100° eastward and 280° westward. As you are about to see, this is an important consideration with regard to the pedestrian's shadow and its angle relative to the thick black stripe on the terminal floor. In the photo below, you have a good profile view of the original Main Terminal at Washington Dulles International Airport as seen from the west and facing east. Since the photo was taken circa 1963 by Donald Corner and Jenny Young (permission pending from Artifice Images), wings have been added to this historic structure. Note that the line in the sidewalk is at a 100° heading, that all the entrances face north, and that there is not enough room on the sidewalk to add an entrance facing east at a 100° heading. Please note that interior and exterior construction and renovation have been done since 9/11, but none of this changed the approach from the north of ground passengers to their departing flights. The access road Saarinen Circle directly adjacent to the north face of the main terminal at Dulles Airport makes this abundantly clear. So you see, in this Google Earth view of the Dulles Airport terminals from 4,770 feet in the photo at left, the Main Terminal at the center top is where ground passengers arrive for departing flights. The access road Saarinen Circle leads them there, where they enter the main terminal on the north side, and then proceed by foot, moving walkways, shuttle lounges or shuttle buses to their departure gates at the two mid-field terminals. 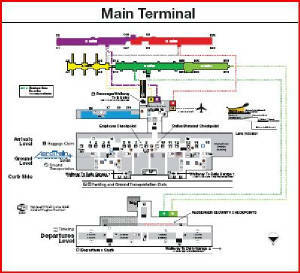 The east, south and west sides of the Main Terminal are adjacent to airport operations areas where passengers do not enter or exit. One mid-field terminal is seen in the lower center of the photo, and the other is at the bottom edge of the photo. And so, one may conclude, subject to verification in a proper judicial discovery process, that if the north face of the Main Terminal runs perpendicularly to the two main parallel runways 1/19L and 1/19R, then the black stripe painted onto the terminal floor is exactly parallel with the runways as it is also clearly perpendicular to the north face of the terminal. 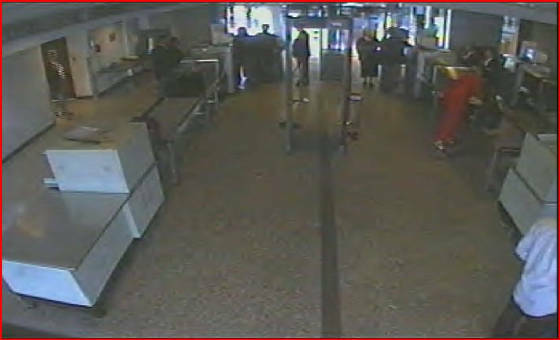 From this one may also conclude that if indeed the passengers for departing flights enter the Main Terminal on its north side, then the shadow of the pedestrian just outside the terminal entrance, which points directly at the CCTV giving us the image, is on a southward heading of approximately 170° or 180° relative to the thick black stripe on a heading of 190°. Naomi C. Klaus, Associate General Counsel of the Metropolitan Washington Airports Authority, has confirmed in her 5 January 2011 reply to my query that "Passengers entering the terminal to catch flights come in on the north side of the terminal. On September 11, 2001, passengers going to the gates to board airplanes would have walked south through the security checkpoints. At that time, there was a video camera facing north focused on lane 1." From all of the foregoing we may conclude that the shadow of the passerby is cast from a direction where the sun never shines relative to Washington Dulles International Airport. The sun would have to be setting in the northwest in order to cast the shadow seen in the CCTV image. 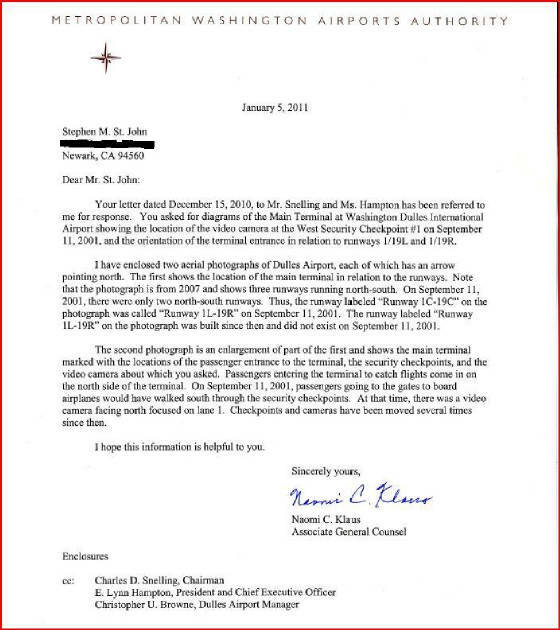 Therefore, the CCTV video is bogus in that it could not possibly have been filmed at Dulles and must have been filmed elsewhere and then fraudulently presented as having been filmed at Dulles Airport on the morning of 9/11. The terminal entrance where the alleged hijackers allegedly entered had to have been facing east for the pedestrian's shadow to be true to the time and place of the event purportedly shown in the video. 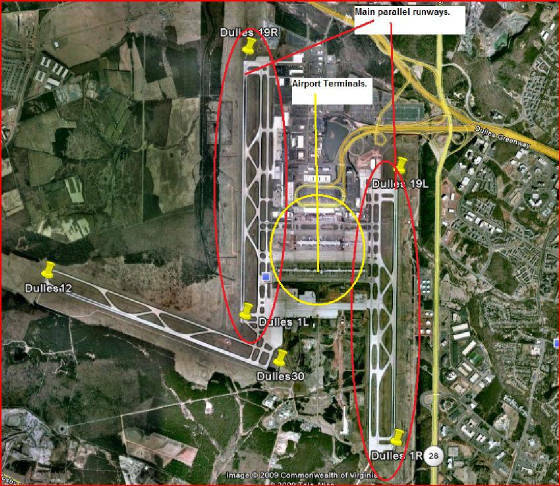 However, the Metropolitan Washington Airports Authority has confirmed that there was no entrance facing east which the alleged hijackers could have used to enter the Main Terminal at Washington Dulles International Airport on the morning of 11 September 2001. Even if such an eastern entrance existed at that time, there would still be problems with the surveillance tape and its dubious depiction of shadows making a crazy sundial effect. This matter has now been addressed in Appendix C at the end of this presentation and may very well be useful for probing the state of mind and methods of the true perpetrators. Given that there is no time indicator shown in the video, and given the strong prima facie case that the video was not filmed at Washington Dulles International Airport, one must consider the strong liklihood that certain officials within the US Department of Justice obstructed justice by a calculated presentation of fabricated evidence. Whatever the case, it is perfectly clear that we have NEVER seen ANY credible video surveillance images of ANY of the passengers and alleged hijackers at ANY of the three airports from which the flights of 9/11 are said to have departed. How can this be explained? Billions of people around the world repeatedly saw a video of two alleged terrorists passing through a metal detector, but few know that this propaganda film was made at Portland Maine International Airport and not at Boston's Logan International Airport. This Portland video, and the bogus "Dulles Airport" video, are all we have as evidence! How can this be explained? How could we have invaded Afghanistan and Iraq without even asking these questions first? Again, these conclusions are tentative in that they are subject to verification in a proper judicial discovery process. 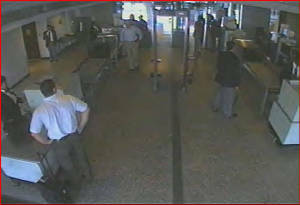 Although I have not had an opportunity to verify the presented data by direct inspection and interviews with airport authorities, the Metropolitan Washington Airports Authority has kindly established that on 11 September 2011 the video surveillance camera at "West Security Checkpoint #1" faced north and passengers walked south through this checkpoint before heading to the gates for their flights. This information from an authoritative source gives a reliable framework in which to analyse the passerby's shadow seen outside the terminal entrance. Basic astronomy takes care of the rest. The shadow does not comport with the given scenario, and would not do so under any circumstances at any time at the latitude and longitude of Washington Dulles International Airport in Herndon, Virginia. This presentation ought to be the starting point for a new and real investigation of 1) the shock & awe doctrine; 2) the events of 9/11; and 3) the cover-up of 9/11. Let the truth be told, and let justice be done! This remains to be done, perhaps under the aegis of a 9/11 International Independent Investigation Commission established and supported by the United Nations, if not by the United States Government itself. The pursuit of 9/11 truth and justice will very likely have real peace as a collateral benefit. I write to urge you to examine my discovery of a bogus Dulles Airport video surveillance tape used to frame Arabs for the shock and awe crimes of 9/11, as set forth below in my article entitled Dulles Airport Shadow casts Doubt on US Government's 9/11 conspiracy Theory. This strong evidence of a major fraud perpetrated from within the ranks of the US Department of Justice is but one of many, many reasons to conduct a new and a real investigation of 9/11, including the cover-up and the possibly underlying "shock and awe" doctrine. I am at your service to conduct such an investigation. My contact information also follows. I close with an old adage which George W. Bush famously botched: Fool me once, shame on you; fool me twice, shame on me. The day after Zacharias Moussaoui lost his appeal, I sent the following email to his court-appointed attorney, Justin Antonipillai, and a letter by regular mail to the Chief Judge of the 4th Circuit Court of Appeals, William B. Traxler, Jr.. I believe my investigation and analysis of the airport video used in the original Zacharias Moussaoui trial shows fraud on the part of the US Government, and for that reason alone the 2006 verdict should be overturned and a new trial ordered. You can read my recent 31 December 2009 letter on this subject to Chief Judge Loretta Preska here in the Southern District of New York at http://www.show-the-house.com/id96.html. There you will find the link to my article, Dulles Airport Shadow casts Doubt on US Government's 9/11 Conspiracy Theory. Or, you can click right here to read it: http://www.show-the-house.com/id92.html. Inasmuch as a version of this video was also used to promote the release of the 9/11 Commission Report on 22 July 2004, I believe my finding demands a new and a real investigation of what really happened on 9/11. I believe Zacharias Moussaoui is just an unfortunate pawn on the Grand Chessboard. Chief Judge William B. Traxler, Jr. Regarding the case of Zacharias Moussaoui, I have discovered in the course of my own independent research that the purported Dulles Airport video surveillance tape, which our government presented as evidence in the original trial, is a fraud. Basic astronomy and geometry prove my point. And so I urge you to read my article, Dulles Airport Shadow casts Doubt on US Government's 9/11 Conspiracy Theory, on my website at http://www.show-the-house.com/id92.html. I became more than curious on this subject upon realization that there were no airport video surveillance images of any of the passengers or hijackers at Newark's Liberty International Airport and Boston's Logan International Airport on the morning of 11 September 2001. My boss, Marion Britton, the Assistant New York Regional Director of the Bureau of the Census, U.S. Department of Commerce, was on United Airlines flight 93 out of Newark. I know I never saw Marion again. Beyond that, most of what I've heard and read on 9/11 I find unbelievable. You are bound by your oath of office to prevent fraud and force in our courts. Therefore, I appeal to your conscience and ask you to take the initiative to verify my findings regarding the purported Dulles Airport video tape, and then take appropriate action based on this new information. Pedestrian in background gives away the game, and exposes the praxis of evil in our midst. Below is a close-up of the pedestrian casting shadow. 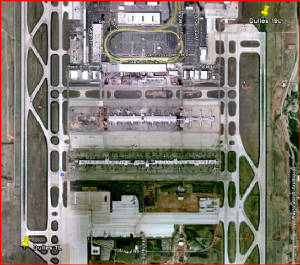 Aerial photo below from Google Earth gives north/south orientation of runway headings (10° and 190°) and east/west orientation of the north and south sides of the airport terminals (100° and 280°) with north at top, south at bottom, east at right and west at left. 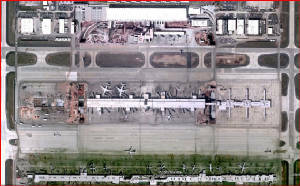 In the next two photos below, the north/south faces of the airport terminal structures are shown to be perpendicular to the main runways, and the direction of arrivals of ground passengers for departing flights is clearly shown to be from the north side of the Main Terminal, where the auto traffic oval is located. The east, south and west sides of the Main Terminal are adjacent to airport operations areas where passengers do not enter or exit. They enter and exit at the north side of the Main Terminal only. Below is a closer view of the main terminal to the north and the two mid-field terminals south of it. Passengers enter all three of these terminals from the north side. 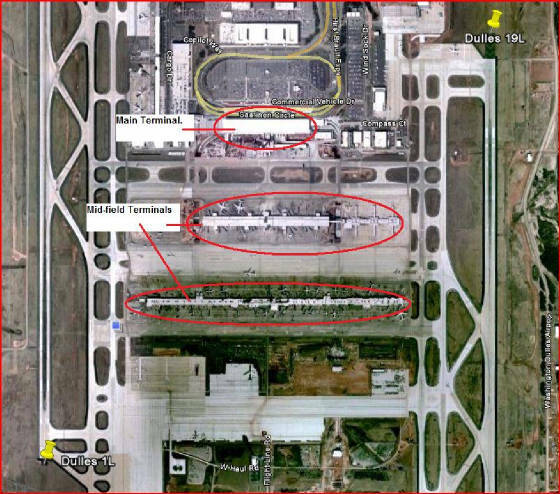 In the next two photos, the thick black stripe running on the ground from the door to the camera is parallel to the main runways on a heading of 190° if this photo is indeed from an authentic Dulles Airport video surveillance camera. It would then follow that the yellow line is very nearly on an exact north to south heading of 180° from outside the entrance to the camera inside. And this is the direction of the shadow cast by the passerby. The only problem is, the sun does not cast its shadow from north to south. Therefore, this video is bogus. It was filmed elsewhere and then fraudulently presented as having been filmed at Dulles Airport by agents of the US Government and perhaps others in order to frame the Arabs for 9/11. This deception could not have been accidental. This fraud could only have been perpetrated with foreknowledge of 9/11 and it is one of many components of an action plan to establish a pretext to invade Afghanistan and Iraq and neighboring states. The sun is a reliable witness, and basic astronomy and geometry give the proof. This presentation ought to be the starting point for a new and real investigation of 1) the shock & awe doctrine; 2) the events of 9/11; and 3) the cover-up of 9/11. Let the truth be told, and let justice be done! Somewhere along the chain of custody of evidence for this video surveillance tape (exhibit NT00211 at the 2006 Zacharias Moussaoui trial) is the link to the treasonous praxis of evil in our midst! By what authority did the South Carolina law firm Motley Rice LLC make a version of this tape available to the Associated Press to promote the release of the 9/11 Commission Report the next day, 22 July 2004? And by the way -- not to change the subject -- I'd like to know the whereabouts of Admiral Michael Mullen on 9/11! Please note that on 5 January 2011 the Metropolitan Washington Airports Authority confirmed that passengers going to their flights enter the Main Terminal at Washington Dulles International Airport on the north side of the building only. Therefore, Appendix C becomes an academic exercise only after the existence of a terminal entrance facing east has finally been ruled out. However, this Appendix C may very well be of value in probing the state of mind and methodology of the real perpetrators of 9/11. Examination of photos available in the public domain do not show any entrances facing east at the Main Terminal of Washington Dulles International Airport. 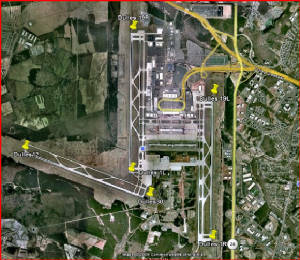 Aerial photos from Google Earth show that the east, south and west sides of the Main Terminal at Washington Dulles International Airport are adjacent to airport operations areas where passengers do not enter or exit. Passengers do enter and exit on the north side only. However, there are no entrances to be found facing east on the north side of the Main Terminal. 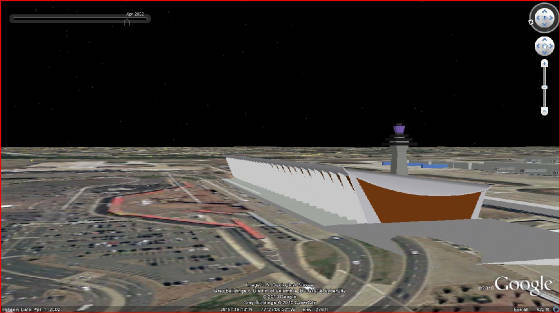 Below is a Google Earth 3D view looking south at the north face of the Main Terminal at Washington Dulles International Airport. There is not a hint of an entrance facing east. 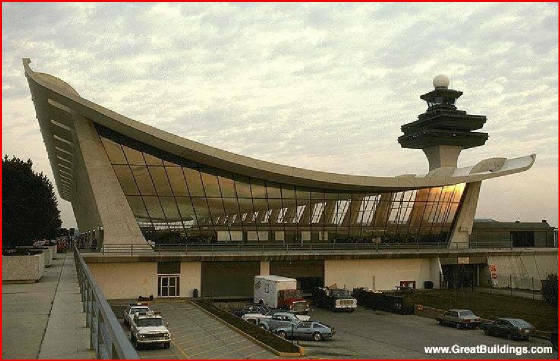 And from the Metropolitan Washington Airports Authority website we have this photo (below) of the Main Terminal at Washington Dulles International Airport as seen from the northwest. 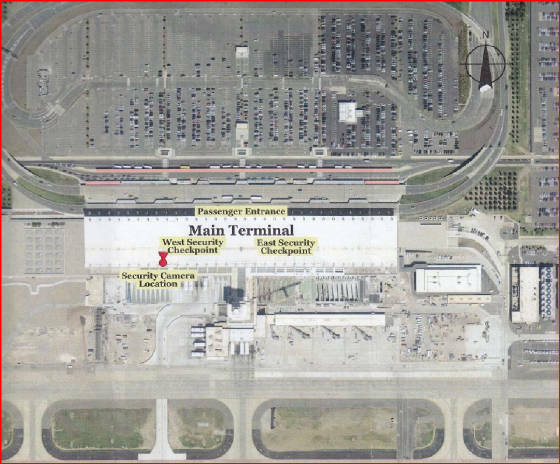 Bear in mind that the US Department of Justice Trial Exhibit "Surveillance videotape from Dulles Airport West Security Checkpoint#1" allegedly comes from the near end of the Main Terminal building as seen in this photo. But there is no sign of an entrance facing east anywhere along the north face of the terminal! 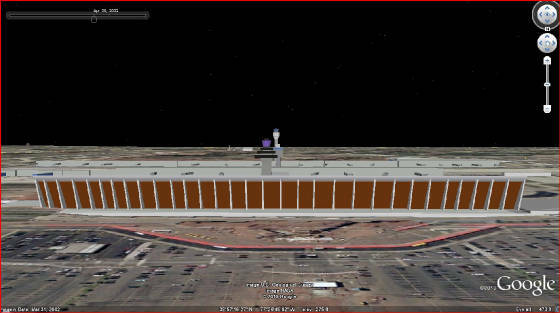 And below is another Google Earth 3D image as seen from northwest by west. Again, there is no entrance facing east along the north face of the Dulles Main Terminal. Below is a still from a TV broadcast on the evening of 21 July 2004, the night before the publisher's release of the 9/11 Commission Report. It shows the Main Terminal at Washington Dulles International Airport from the northwest. The roadway runs eastward at a 100° heading, and the entrances to the Main Terminal face north. There is no indication of any entrance facing east. 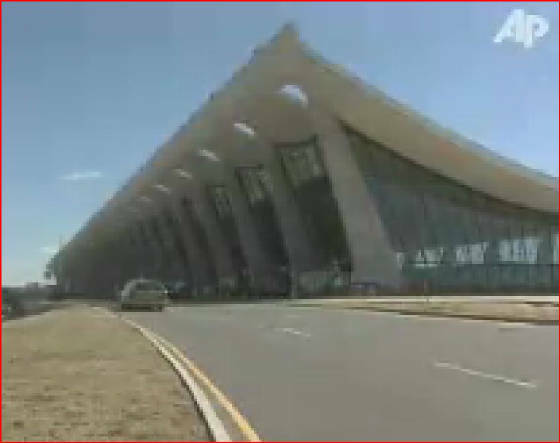 In the image below, you have a good profile view of the original Main Terminal at Washington Dulles International Airport as seen from the west and facing east at a 100° heading. Since this photo was taken circa 1963 by Donald Corner and Jenny Young (permission pending from Artifice Images), wings have been added to this historic structure. Note that the line in the sidewalk is at a 100° heading, that all the entrances face north and that there is not enough room on the sidewalk to add an entrance facing east at a 100° heading. Without a proper judicial discovery process, the doubt about an entrance facing east at Washington Dulles International Airport lingers. Yet the only plausible explanation of the sun's shadows cast by passersby in the far background of the purported "Dulles Airport" video surveillance tape would be if the entrance were indeed facing east. So, without any indication of an entrance facing east, and without any accountability from our government on this point, and without a proper judicial discovery process to resolve the issue, let's pretend there was such an entrance facing east at Washington Dulles International Airport through which the alleged hijackers allegedly passed before boarding the ill-fated American Airlines Flight 77. As we shall see below, even if there were such an entrance facing east, close analysis of the purported "Dulles Airport" video surveillance tape reveals deep problems with the shadows cast by the sun. These shadows are only superficially plausible. A closer look shows a crazy sundial effect. Since we know that the main parallel runways are at 10° and 190° headings, and that the north face of the Main Terminal is perpendicular to the runways, we also know that the north face of the Main Terminal extends at 100° and 280° headings. Facing east at a 100° heading, as seen in the Corner-Young photo above, we turn to the ingenious Stellarium software program to study the motion of the rising sun and the shadows that we can expect to see. In the Stellarium images shown below, the setting is for Herndon, Virginia, which is the location of Washington Dulles International Airport at N 38° 58' 12.00" W 77° 23' 24.00". 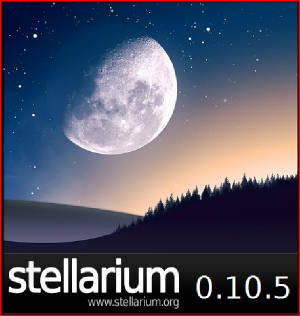 For demonstration purposes, Stellarium functions as a planetarium as seen from Washington Dulles International Airport on the early morning of 11 September 2001. (The green field is a default setting depicting the environs of Guéreins in the valley of the Saône river, 50 km north of Lyon, France. Guéreins is where Fabian Chéreau created Stellarium. Just west of Guéreins stand the Alpine foothills of the "Beaujolais" where the famous wine is produced.) For the present purpose, the 100° heading of the azimuthal grid serves as the north edge of the Dulles Airport Main Terminal as seen in profile from west of the terminal and looking east. Once the sun passes the 100° heading, the north face of the terminal is totally in shadow. Without a graphics artist at my disposal, I cannot place the terminal building in the picture. This must be left for the reader's imagination at least for the time being. The Stellarium image below shows morning twilight as seen from Washington Dulles International Airport on 11 September 2001. The red letter E for East is at a 90° heading and the next line to the right of it marks the 100° heading. This 100° heading coincides with the north face of the Main Terminal as seen sideways from the west and looking east. Again, the reader must imagine the terminal building's being there until a competent graphics artist comes to my rescue. 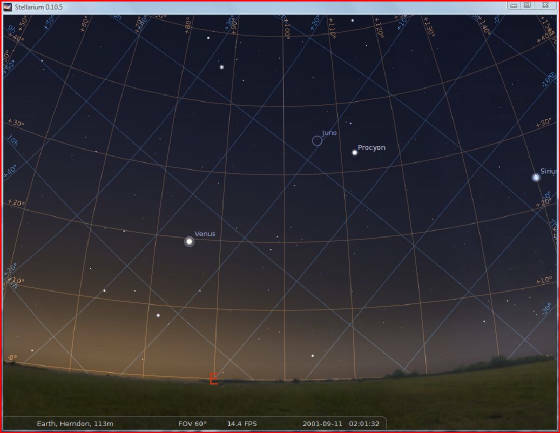 Stellarium shows the bright stars Sirius and Procyon as well as the planet Venus as they begin to fade away in the solar glare. The Stellarium image below was taken just minutes before sunrise at Washington Dulles International Airport on 11 September 2001. 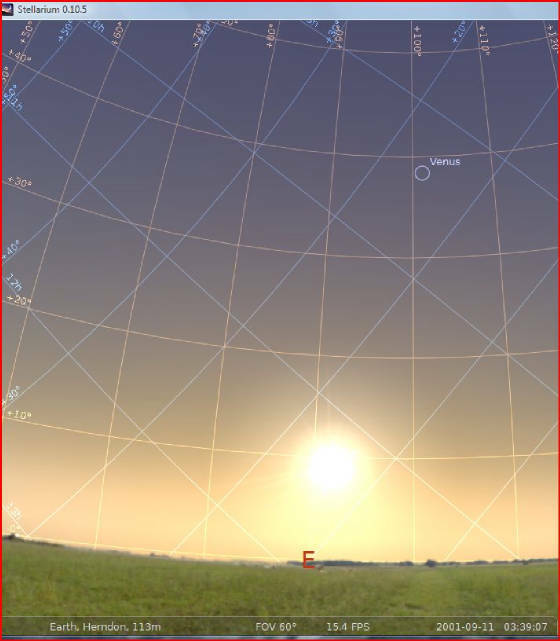 At this point in time, the disc of the sun is just below the horizon near the line marking the 80° heading, which is to the left of the 90° heading bearing the red E for East. 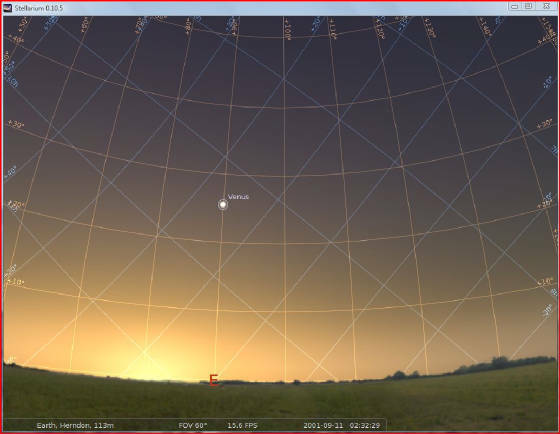 The Stellarium image below shows sunrise at Washington Dulles International Airport on 11 September 2001. The solar disc makes its initial appearance at an approximately 84° heading. As you are about to see, the earth spinning round makes the sun move diagonally toward the south as it rises in the sky. Before the sun reaches 10° above the horizon, it will have gone nearly 10° southward too, from an approximately 84° heading to an approximately 93° heading. As a result of this diagonal rising of the sun, in a matter of minutes shadows shorten and shift northwards. The Stellarium image below shows the approximate time (7:18AM) when the first two alleged hijackers, Majed Moqed and Khaled Mihdhar, allegedly arrived at the alleged security checkpoint at "Dulles Airport." The image below shows a shadow cast by the sun off a passerby in the same time-frame as the alleged Moqed-Mihdhar arrival at the "Dulles Airport" security checkpoint. 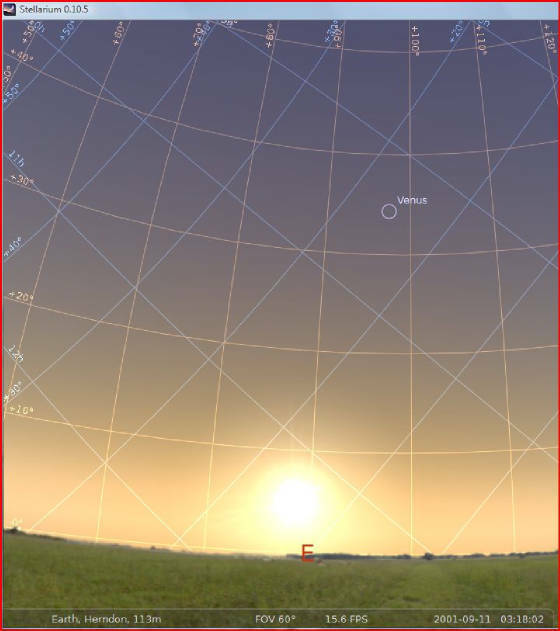 The Stellarium image below shows the position of the sun at the approximate time (7:39AM) the image of the passerby's shadow was taken, which was just a few minutes after the alleged arrivals of the other three alleged hijackers, Hani Hanjour, Salem and Nawaf al-Hazmi, at the alleged security checkpoint at "Dulles Airport," and about twenty minutes after the alleged arrival of the first two alleged hijackers. In this twenty minute interval, one would expect to see a shortening and shifting northwards of the shadows. The image below is that of the passerby shortly after the alleged arrivals of Hanjour and the Al-Hazmi brothers at the "Dulles Airport" security checkpoint and about twenty minutes after the earlier alleged arrival of the first two alleged hijackers Moqed and Mihdhar. In comparison with the shadow photographed twenty minutes earlier, this shadow shows neither a shortening nor a shifting northwards (to the left) which one would expect to see as the rising sun inclines to the south (to the right). Indeed, it appears that the opposite is true, howsoever slight the difference may be. This is the crazy sundial effect. Are the officials at the US Department of Justice, or the company they keep, clever enough to stop the motion of the sun? 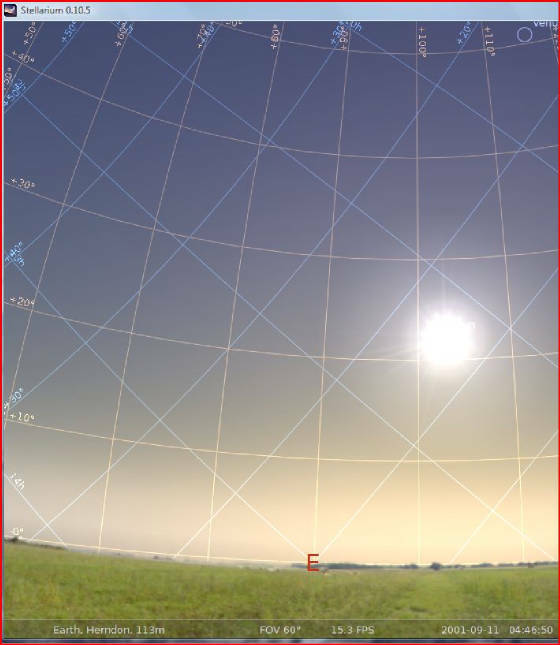 The Stellarium image below shows the sun after it has moved past the 100° mark of the azimuthal grid, at which point the north face of the Main Terminal at Washington Dulles International Airport is in complete shadow. Were it not for the fact that the US Department of Justice condensed an approximately twenty minute interval into two whole segments totaling less than six minutes of video, there would be many more shadows to study for confirming or ruling out their expected steady progression of shortening and shifting northwards. Barring a proper judicial discovery process, such a study of the entire video tape is not possible. Furthermore, the mysterious lack of timestamps on the video tape compounds the problem. Without a proper judicial discovery process, this matter cannot be probed. Without a proper judicial discovery process, a shadow of doubt compromises the integrity of the US Department of Justice Exhibit NT00211, the "Surveillance videotape from Dulles Airport West Security Checkpoint #1." Perhaps this videotape came off the rack from the untold and unfathomable terabytes of the Pentagon's "Able Danger" project or from another project of some such agency and were conveniently available to the evildoers so as to frame "likely suspect" Arabs and justify an otherwise unjustifiable invasion and occupation in the Middle East. But like most suits bought off the rack, their selection was not perfectly tailored and the faults are obvious to a discriminating eye. The Emperor wears a cheap suit! 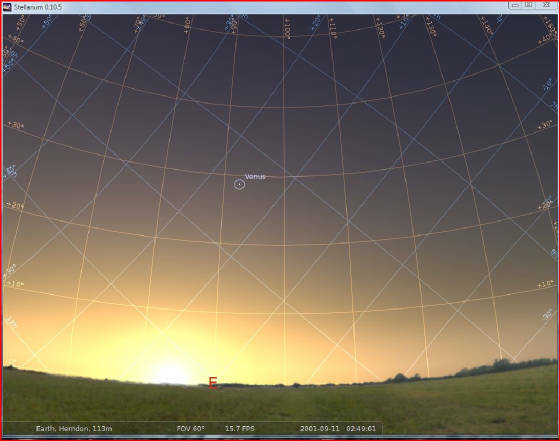 This exercise with the help of Stellarium software presupposes a passenger entrance facing east at Washington Dulles International Airport. But such a presupposition is doubtful and without a proper judicial discovery process, will remain in doubt. The "Dulles Airport" shadow continues to cast doubt on the US Government's 9/11 conspiracy theory that 19 Arab hijackers fooled a high tech multi-layered security system, defied the laws of physics, and even made the sun rise in the northwest (if you accept that the passenger entrance at Dulles Airport faced north) or, better yet, made the sun stand still (if you accept that the passenger entrance at Dulles Airport faced east). Please note that on 5 January 2011 the Metropolitan Washington Airports Authority confirmed that passengers going to their flights enter the Main Terminal at Washington Dulles International Airport on the north side of the building only. Therefore, Appendix C becomes an academic exercise only now that the existence of a terminal entrance facing east has finally been ruled out. However, this Appendix C may very well be of value in probing the state of mind and methodology of the real perpetrators of 9/11. In the meantime, a more certain, concise and cutting version of this article can now be read at http://www.show-the-house.com/id107.html. This is still an investigation and a work in progress (18 February 2011).